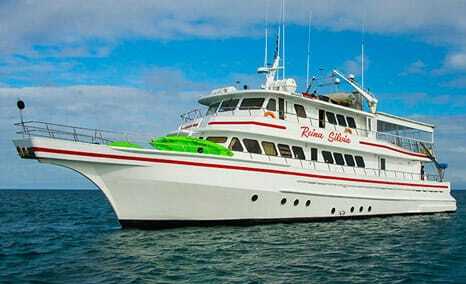 Named after H. M. Queen Silvia of Sweden, with gracious permission, Reina Silvia operates carefully arranged cruises in the Galapagos Archipelago. Built by Lydia Inc. of Stuart, Florida, USA, Reina Silvia is 90 feet long. 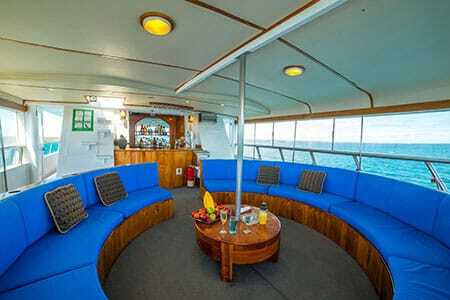 She was redesigned to create a pleasant atmosphere for groups of 12 to 16 distinguished passengers. With a highly trained crew of eight, including a multilingual naturalist guide. ✓ Air-conditioning controls in each of the cabins. ✓ Salon with entertainment center, DVD and wet bar. ✓ Well equipped kitchen and a spacious dining room. ✓ Hall and sundeck are used for lectures and conferences. 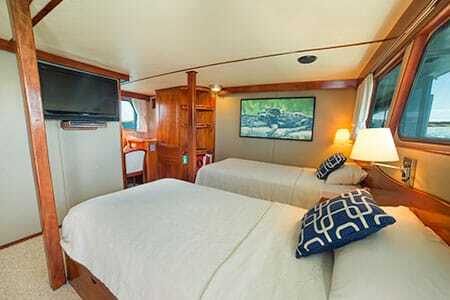 Main Deck: 1 stateroom with two lower twin beds or one king-sized bed. 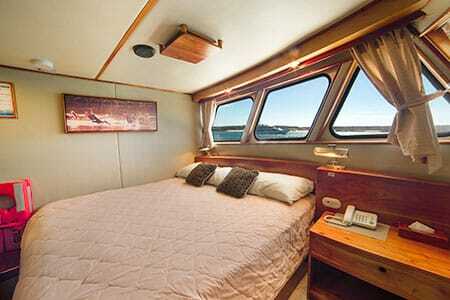 Upper Deck: 1 stateroom with two lower twin beds or one king-sized bed. Thank you to for getting us on this cruise. It could not have been better. The Reina Silvia and its crew were excellent. Franklin the guide was fantastic. I could see how much he loved his job, cared about the passengers and was passionate about the Galapagos. The other passengers on the cruise were great as well, and made every day fun. The trip really was wonderful. Thanks for reaching out for feedback so promptly. I am thrilled to tell you that the vacation was everything we had hoped for! Your assistance in some special arrangements and needs that we had was outstanding and so greatly appreciated. The ship was very comfortable, immaculately taken care of, and so well staffed. On our second week, there were 8 passengers and 9 crew! Although this isn't the norm, we sure did get well taken care of by all! Our two week journey was certainly one of those trips that will always remain in your top 5 vacation memories. To say it was outstanding is an understatement! Oh, and the food... amazing! What a chef we had! The food was great variety and not even repeated from one week to the next. Delicious and great diversity is how I would describe the meals. All of my friends and family will be hearing about this trip. If any decide to take such a trip, I will be sure to pass on your contact information. The only disappointment of the trip was the Wyndham. It wasn't awful, but multiple small mistakes and service issues add up when you're only there for 6 hours. I would not recommend this hotel to your clients. The SwissHotel was absolutely outstanding and worth the drive back and forth. Those folks treated us like royalty! Just wanted to drop you a quick note to say thank you for organizing our holiday on the Reina Silvia. We had a fantastic time. The islands were spectacular and the Reina Silvia crew could not have been more helpful or have given us a better time. We completed our tour in Galapagos with Reina Silvia. Everything was great and well planed. Our guide Greg is the best. We will recommend your agency. Thank you very much for all your help.We will visit Ecuador again soon. Thank you so much Olga! Our Cruise was totally Amazing! It is my best trip ever! All went well with trip and Denise and I wanted to thank you for organizing things so well. 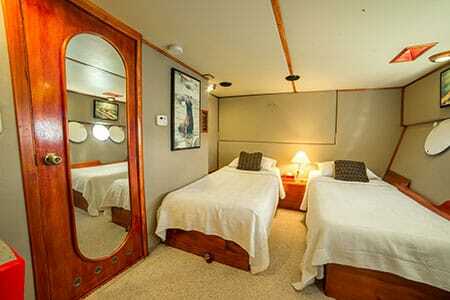 Cabin 2 on the Reina Silvia was first class as were the Marriot and the transfers. 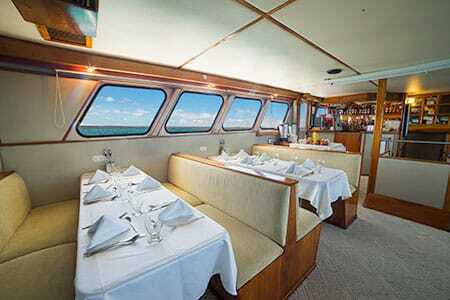 We will recommend you to any friends thinking of a trip to the Galapagos. All went well with trip and Denise and I wanted to thank you for organizing things so well. 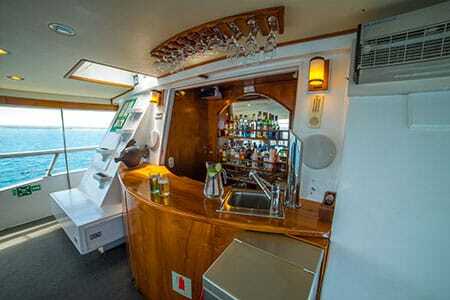 Cabin 2 on the Reina Silvia was first class as were the Marriot and the transfers. We are back home now from our trip and reflecting on our adventure you planned for us. It was way beyond anything I could have imagined. So many beautiful and interesting places in Ecuador. From the beginning pickup at the airport with Jorge, to a wonderful, brilliant very professional guide, Marco, for our grand tour of the country. Our week aboard the Reina Silvia, the guide, Jose and crew were top notch. The trip to the rain forest, lodge, and guide. Rodrigo were totally amazing. The places we stayed were magnificent, the food outstanding, people so very friendly and accommodating and every city had it's own charm. The history of your country is very interesting and I can see how you are growing and improving. I hope one day to return.